Full Dentures vs Partials: What are the Differences? According to the American College of Prosthodontists, approximately 120 million Americans are missing at least one tooth. If you are among that number, you already know the significant impact a missing tooth can have on your confidence and everyday quality of life. Gaps in your smile not only affect your physical appearance but can also make it more difficult to chew food properly and can even affect your speech. If you are considering investing in dentures to replace missing teeth, one big question you face is: full dentures or partials? Today’s blog post will go over the key differences. Dentures, or artificial teeth and gums, have long been one of the most popular solutions to replacing missing teeth. 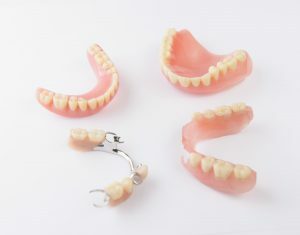 Made from a hard resin, dentures are custom-designed to fit your mouth and blend in visually with your existing teeth. Although not as strong as natural teeth, dentures can help you once again eat, speak and smile like normal! If you still have several or more healthy teeth remaining in your upper or lower jaw, partial dentures can help fill the missing gaps in your smile and prevent remaining teeth from shifting in your mouth. Partial dentures typically consist of artificial replacement teeth attached to a natural-looking gum-colored plastic base. Small metal clasps attach to adjoining healthy teeth to keep removable partial dentures in place while you go about your day. Conventional dentures – Typically take 8 to 12 weeks to make and are created after any remaining teeth are removed and the gums have healed. Immediate dentures – Made in advance and immediately placed in the mouth once teeth have been removed. Adjustments sometimes must be made once the gums have had time to heal. Immediate dentures are often eventually replaced by conventional dentures. If you are missing several or more of your teeth, partial or full dentures may be the right dental treatment option for you. The cost of partial and full dentures can vary from several hundred to several thousand dollars depending on the custom needs of the patient and the quality of materials selected. Having a conversation with a dentist in Wharton is the best way to find out what type of dentures best suit your dental needs and budget. While dentures may never feel exactly like natural teeth, today’s modern dentures are custom-designed to look natural and feel more comfortable than ever. Talk to a dentist about how you can rebuild your smile and your confidence with dentures! A graduate of the University of Texas Health Science Center Dental Branch, Dr. David Tripulas is one of only 2200 dentists in 44 years to be awarded Mastership from the Academy of General Dentistry. He understands the importance of a full, healthy smile, which is why he offers full and partial dentures to patients in Wharton. To learn more about your options to replace missing teeth, contact Dr. Tripulas via his website or by calling the office at 979-532-4663. Comments Off on Full Dentures vs Partials: What are the Differences?